Every once in awhile a new product comes out and you wonder what you ever did without it and when can you get more. The new Manhattan Flower Textured Impressions Die is that product for me right now! Every time I use this die, I'm amazed at how wonderful it is. 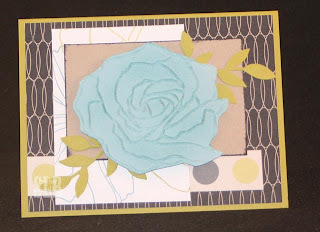 I did a card with it last week (See Friday, March 2th post) that showed the full size of the die but today I cut out a piece for today's Sketch Challenge over at Stampin' Addicts. It wasn't until I was uploading it there that I realized I used no stamps on the front of this card! There is however, a stamped message inside! All products from Stampin' Up! I just love everything about this card - the paper, the flower, the leaves. It's just beautiful!